Total Guitar issue 216 is now on sale. 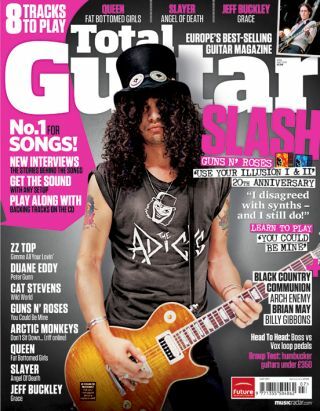 Featuring an in-depth interview with Slash on the recording of 'Use Your Illusion I & II', as well as brand new interviews with Brian May, Joe Bonamassa, Billy Gibbons, Anna Calvi, In Flames and Arch Enemy. The former Gunner talks exclusively to TG about the 20th anniversary of GN'R's 'Use Your Illusion I & II'. BCC's second album was made in a whirlwind four days. Hughes and Bonamassa deliver the inside story. Michael Amott talks us through new album 'Khaos Legions' and five landmark records from his past. He's the original twangster who inspired a generation of guitarists. TG gets an audience with a true legend. The Victory Pill and one-time Prodigy guitarist gives what may be his last ever interview. This issue every Learn To Play track has a brand new interview with the recording artist, or engineer (Jeff Buckley). Read the stories behind the songs, get the sound with any setup and play along with backing tracks on the CD. Over 20 pages of gear news, reviews and advice. Reviews this issue include: Roland GR-55GK, Line 6 M5 Stompbox Modeler, LTD Viper 10, Group Test: humbucker electric guitars under £350, IK Multimedia AmpliTube Custom Shop, HardWire HT-6 Polyphonic Tuner, Schecter Robin Finck Ultra, Head To Head: Vox vs Boss looper pedals, TC Electronic Corona Chorus, Jet City Afterburner, plus Ed's Shed and Accessories reviews. All of TG's Video Lessons are now hosted online through www.totalguitar.co.uk/video, but you'll have to buy the mag to get the most out of them. Here are all the video lessons from issue 216.